A: It is a rule to find respective prices should be mixed to give a mixture at a given price. 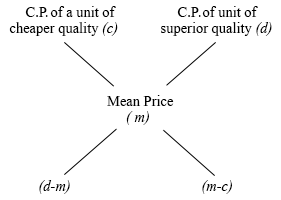 Here, cost price of a unit quantity of mixture is called the mean price. Or in easy term Alligation is a rule which is used to solve the problems related to mixture and its ingredient. Explanation: Suppose x kg of cheaper quality is mixed with y kg of superior quality. And quantity of mixture = (x + Y) kg. Price of mixture/kg = Rs.